From the terrace of the Terrasse Dufferin in Old Quebec City, Canada you have a magnificent view of the heritage buildings on the streets below and the Vieux Port where a cruise ship docks for the day. Beyond the cruise ship, you can see for miles across the horizon where many small water vessels spend the day on the water under the sunny skies that surround Old Quebec. 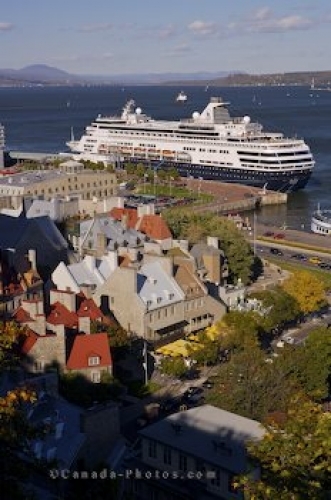 Picture of a cruise ship docked in Vieux Port in Old Quebec in Quebec City, Canada.